Those frosted windshields and travel mugs full of hot tea mean that it’s accessory weather! Fingerless mittens have come out of storage weeks ago, I’ve started carrying around a slouchy hat in my purse for windy emergencies this week and I just sorted through my chest of knit sweaters. I’ve been pretty steadily increasing the winter wardrobes of my extended family and friends every Christmas and this year is certainly no different. I wanted to share a few of my recent favorites to add to your own gift list! 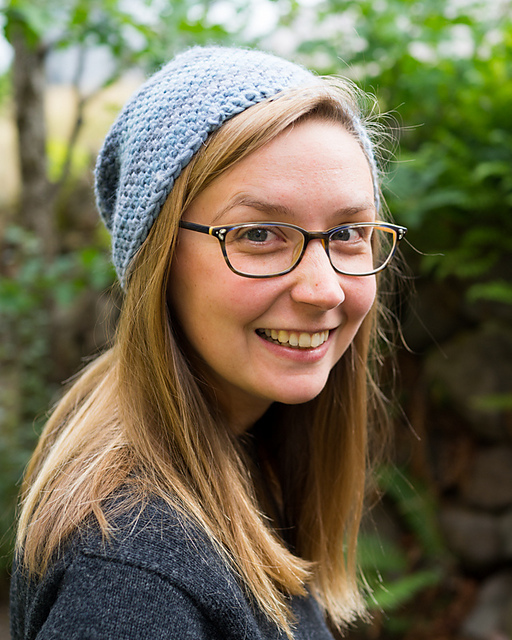 I heard that Tincanknits would be coming to my local yarn shop in a few months ago so I popped over to look at their patterns on Ravelry as a little refresher before I made a trip to see the projects in person. I fell in love with their Antler Hat pattern for a second time and decided to make one for my mother in Full Circle Worsted Ponderosa. 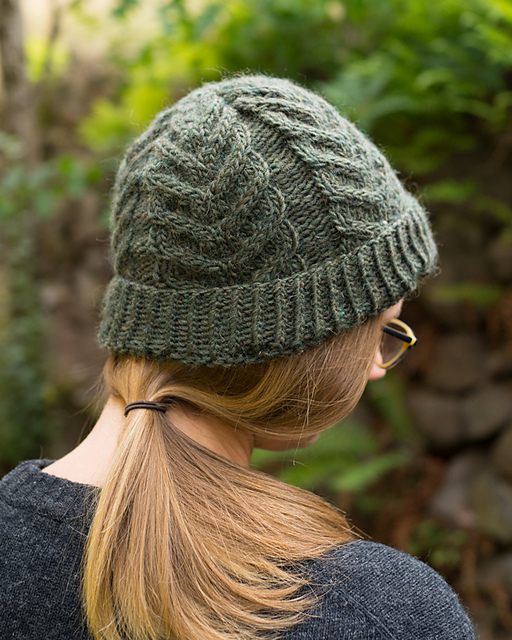 I love the combination of simple repeats in this cable pattern and the lovely stitch definition of Full Circle. The single ply yarn makes such a bouncy, cozy fabric! 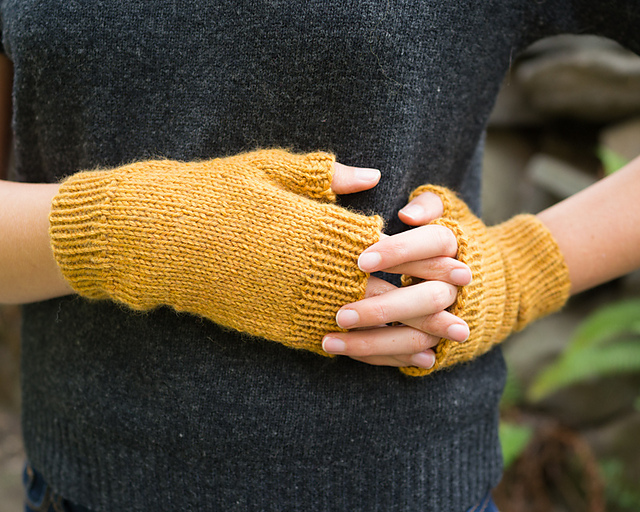 More recently, I whipped up a pair of Stacey’s Semplice Fingerless Mitts (free pattern!) in my favorite yellow: Turmeric in Swish DK. It doesn’t get more autumnal than that. I was able to do them two-at-a-time which means that both thumbs actually ARE the same length (I problem of mine when it comes to mittens). Unisex and super versatile – this pattern has been in heavy rotation lately as I try to whittle down my Christmas gift list! Lastly, I wanted to try my hand a crochet beanie. I still have some Chroma Worsted samples kicking around in my stash and I just love how it crochets up. I discovered Rohn Strong‘s great patterns on Ravelry and tried my hand at his Grizzly hat pattern. It’s got just the right amount of slouch and fits perfectly, this pattern is definitely added to my “second time around” list for last minute gifts. I’ve got my eye on a ball of Chroma Worsted Soft Rock for one and Midwinter for another. Are you still working on big gift projects for Christmas or are you trying to fill in some gaps with smaller accessories too? I still have one more sweater to get crackin’ on but then it’ll be smooth sailing for the rest of the month! Outstanding blog posting I enjoyed it thoroughly!! Thank you for all you do to inspire!